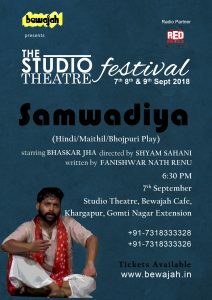 The play talks about a time when the postal services are on the run and the job of Samwadiya (the messenger) is of no use. But to a matter of surprise, he has been called again by a lady who hails from a privilege family but is forced to live in scraps. The message is delivered by Hargovind who narrates each word with exact emotion in which the information is meant to be delivered. The story questions the importance of one man agaisnt the techological leap of the society. 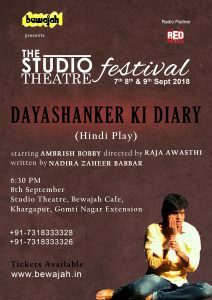 A story of a simple man who travels from his hometown to Mumbai in effort to become an actor. Yet, despite all his efforts, every day he faces indifference and exploitation. He struggles between compromising with reality and following his dreams and trying to decide the aim of his life. 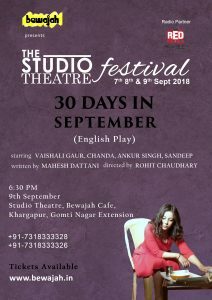 Mahesh Dattani’s 30 Days in September, is a grueling story of child abuse in a simple household, a mother and daughter relationship, and the complexities of a women finding pleasure in the pain while thrown about over the years, making her addicted to romantic relationship that should last no more than 30 days. The performances will be judged by the Audience as well as our esteemed Jury. The best performance, which will have the most points from the audience and our special jury, will win the rewards in three categories: Best Play, Best Actor, Best Director. ONLINE TICKET SALE IS CLOSED NOW! YOU CAN GET YOUR TICKETS AT THE VENUE (BEWAJAH CAFE) FROM 4 PM ONWARDS.